Roger M. Leblanc received a B.Sc. degree in Chemistry from Université Laval in 1964, followed by a PhD in Physical Chemistry in 1968. Then, he obtained a postdoc position at the Royal Institution of Great Britain for two years before moving to the University of Québec, Trois-Rivières, Canada, where he spent 20+ years of studying photobiophysics. He moved his research to the University of Miami in 1994. Dr. Leblanc is Professor and Chair of Chemistry Department at University of Miami. And his research interests are centered on biophotophysics, spectroscopy and surface chemistry and he has published more than 500 research articles related to these topics and has guided more than 100 Ph.D. and M.Sc. Carbon dots (C-Dots) have recently attracted enormous attention due to their unique properties. In this talk, the synthesis, characterization and bio-applications of a new type of nontoxic, water-soluble C-Dots will be presented. A major medical challenge one faces to treat central nervous system (CNS) related diseases is to cross the tight junctions between endothelial cells, which are known as blood–brain barrier (BBB). Recently, our in vivo experimental observations suggested that the transferrin conjugated C-Dots could enter the CNS of Zebrafish while C-Dots alone could not. Thanks to the abundant presence of carboxylic acids on the surface, C-Dots are easily conjugated with transferrin and anticancer drug doxorubicin. The system was then applied as a drug delivery system for the delivery of doxorubicin into cancerous cells. Our in vitro study showed greater uptake of the conjugates compared to free doxorubicin, the conjugates at 10 nM was significantly more cytotoxic than doxorubicin alone, reducing viability by 14~45 %, across multiple pediatric brain tumor cell lines. Accidents, disease and aging compromise the structural and physiological functions of bones, and in vivo bone imaging test is critical to identify, detect and diagnose bone related development and dysfunctions. Here we show that C-Dots with low quantum yield (“dark”) bind to calcified bone structures of live Zebrafish larvae with high affinity and selectivity. Binding resulted in a strong enhancement of luminescence that was not observed in other tissues, including non-calcified endochondral elements. Retention of C-dots by bones was very stable, long lasting, and with no detectable toxicity. 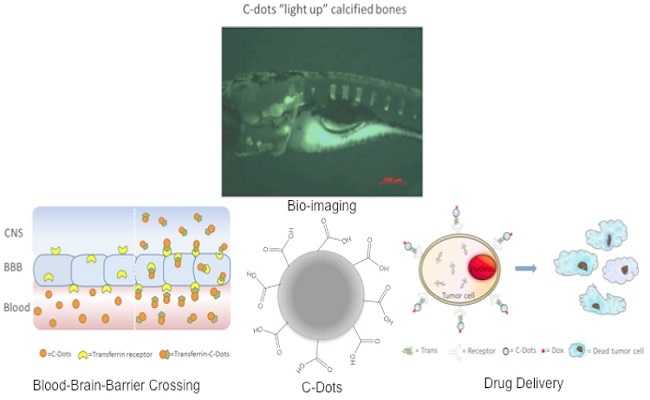 These observations support a novel and revolutionary use of C-Dots as highly specific bioagents for bone imaging and diagnosis, and as a potential bone-specific drug delivery carrier. Keynote: Can matrix effect in LC/MS or LC/MS/MS assay be avoided or fully compensated? Miroslav Ryska holds an Undergraduate Degree from Charles University, along with an MS in Physical Chemistry from Moscow State University and a PhD from the Institute of Macromolecular Chemistry of Czechoslovak Academy of Sciences. From 1961 to 1978, he worked at the Institute of Macromolecular Chemistry of the Czechoslovak Academy of Sciences. From 1978-1997, he worked as a Researcher in the Research Institute for Pharmacy and Biochemistry in Prague. He has written more than 100 publications mainly on the topic of mass spectrometry, trace analyses, analyses of drugs, metabolites and quantitative analysis. Currently he is in the position of Scientific Advisor.